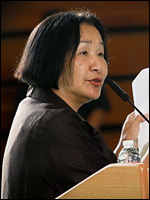 In Oakland, an effort to recall Mayor Jean Quan is officially underway. This week, the mayor's opponents filed 71 signatures with the city clerk in an official notice of intent to circulate a recall petition: Quan opponents file for her recall, hoping to turn 71 signatures into 20,000. Recall supporters, led by Gene Hazzard of the Oakland Black Caucus, now have 160 days to collect somewhere around 20,000 signatures from registered Oakland voters to make the city hold an election. Right now, they have 71. So what's the recallers' problem with Jean Quan? Hazzard's paperwork names several grievances with the mayor. "She has willfully ignored the City's most pressing issue: public safety," the filing states. "She ignored the call of Oakland residents to significantly increase the number of police officers and instead supported a regressive $11 million parcel tax." Charles Pine, of the group Oakland Residents of Peaceful Neighborhoods, signed the petition and echoed the complaint, criticizing Quan for her vote in June 2010 to lay off 80 police officers. Quan was then on the City Council, which was facing tense police union negotiations and a huge budget deficit, and the layoffs won by a 5-3 vote of the council. Meanwhile, the mayor doesn't have a whole lot of time these days to worry herself over a recall. With tear gas currently being fired off on protestors in the streets of Oakland, I think she's got bigger problems on her plate. More here: Oakland Mayor Jean Quan brushes off recall attempt.